Dr. Jen Parsons is a Mazuri nutritionist and formulates diets, conducts research, and provides technical support for our team. Before joining Mazuri, Jen was a zoo nutritionist for 8 years, working with large collections of diverse species at the San Diego and Denver Zoos. She has a PhD in animal nutrition from Mississippi State University, conducting doctoral research with the Memphis Zoo on giant panda nutrition, and a master’s degree in zoology from Oklahoma State University, where she researched nutritional ecology of native prairie wildlife. 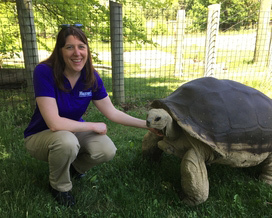 During her bachelor’s work in animal science at Colorado State University, Jen also participated in internship programs at the Woodland Park and Point Defiance Zoos, in the Seattle-Tacoma area.